Tanzania is seeking investments from Nigeria’s richest man, Aliko Dangote. 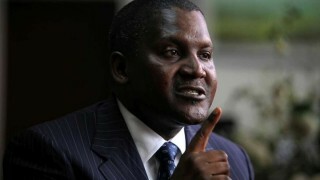 Through an envoy, the country has appealed for Dangote’s investment in the country’s oil and cement industry. This was made known during a tour by the Tanzania Petroleum Development Corporation(TPDC) and the Tanzania High Commission. This tour of the Dangote Refinery and Fertilizer plants situated in Lagos may be the beginning of the Business Mogul’s expansion into East Africa. Commissioner in the High Commission of the Republic of Tanzania, MR Muhidini Mboweto reminded Dangote of the economy’s value and its natural resources like Gold, Gas and even gemstones which could, in turn, lead to attraction of foreign investors, should the investment take place. “Tanzania has a politically stable economy; it is surrounded by eight countries and six are landlocked, so their ports depend on Tanzania,” he said. The Commissioner has appealed to Dangote to expand his wealth into the petroleum and cement sector, a collaboration between these two will make Tanzania self-sufficient in petroleum products. Although the CEO of Dangote Group is yet to release any formal acceptance of his investment offer, it is perceived that an investment may also be good for the company. In addition to the country’s petroleum and cement industry, there are also opportunities in Tanzania’s tourism and wildlife resources, which are considered among the finest in the world. The direct and indirect contribution of tourism was 14 percent of Tanzania’s GDP in 2014 with USD 6.7bn. According to the World Travel and Tourism Council (WTTC), this is expected to rise by 6.6 percent annually in the next 10 years. Tanzania also shares bilateral relations with Brazil, Canada, China, India and even Japan.